We all know that dogs have that special gift of bringing peaceful and loving light into our homes. Why not treat them with a necklace that represents their peaceful Ambient light? 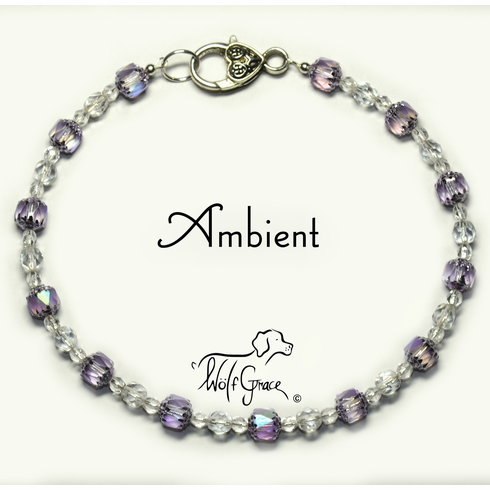 A reflection of your dog�s beauty and calm aura are captured within the enchanting look of the 8mm x 8mm Czech Cathedral Glass Alexandrite Iridescent/AB finish Silver Ends. Watch, as every sparkle of sunshine shimmers within the facets of the 6mm Faceted Round Czech Fire Polished Glass beads, and the 4mm Faceted Round Czech Fire Polished Glass Crystal beads. We think that the Czech Fire Polished Glass Crystal beads really set off the Czech Cathedral beads, especially with the silver hardware. This necklace will leave a gentle and warm impression on all who are graced by it, just as your dog does in your heart. Be assured that the necklace will continue to dazzle and shine, like your furry best friend. These beads are strung on Sterling Silver jewelry-grade wire. Notice on each end of the necklace, how the Sterling Silver crimp covers reinforce and conceal the Sterling Silver crimps, which hold the beads securely in place.